It’s time for another edition of Freebie Friday! Today we’re taking a look at an incredible free suite of audio plugins by Blue Cat Audio. The Freeware Plug-ins Pack II includes 6 different audio plugins compatible with your favorite DAW. What makes Blue Cat Audio’s Freeware Plug-ins Pack II special is that they aren’t the typical crappy free plugins. In the Freeware Plug-ins Pack II you’ll find a 3-band semi-parametric EQ (Blue Cat’s Triple EQ), a vintage sounding phaser (Blue Cat’s Phaser), a visual frequency analyzer (Blue Cat’s FreqAnalyst), a delay that makes a “chorus effect” (Blue Cat’s Chorus), a funky flanger (Blue Cat’s Flanger), and a gain control (Blue Cat’s Gain Suite). It’s no secret they want you to buy their premium plugins so they’re offering some of the best basic plugins for free – take advantage of it! This is actually great start for a beginner audio engineer or someone who can’t afford spending tons of money on plugins. At the price of free you can’t really beat a whole suite of audio plugins. Right below you can see tutorials Blue Cat Audio made to help you get started with their plugins! 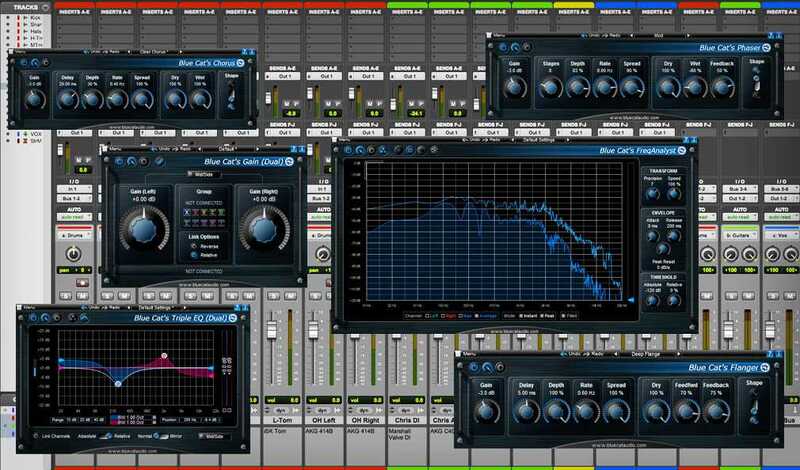 The plugins work on both Windows and Mac (32 & 64 bit) and come in VST, RTAS, AAX, Audio Unit and DirectX formats. So compatibility should be available to pretty much everyone regardless of your OS or DAW of choice. Head on over to Blue Cat Audio’s Freeware Plug-ins Pack II download page to choose the appropriate version for you. FL Studio is an amazing digital audio workstation (DAW) used by producers around the world. Even major producers like BOI-1DA, DEADMAU5, and 9th Wonder love using FL Studio because of it’s versatility and intuitive interface. We wanted to give our readers the chance to win a copy so we’ve partnered up with Image-Line (FL Studio developer) for an FL Studio 11 Producer Edition Giveaway! Enter now below!